Lydia Chen translates the pan chang as the endless knot and Buddhist treasure in her first Chinese Knotting book. I have since tried to research the issue in English. 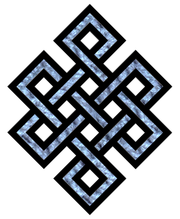 The endless knot is one of the eight Buddhist treasures, 8 symbols that represent key aspects of the Buddha (the endless wisdom of Buddha), Buddhist teachings (the harmony that the many dual aspects of the universe find together), and parts of Buddha (the endless knot being the intestines). 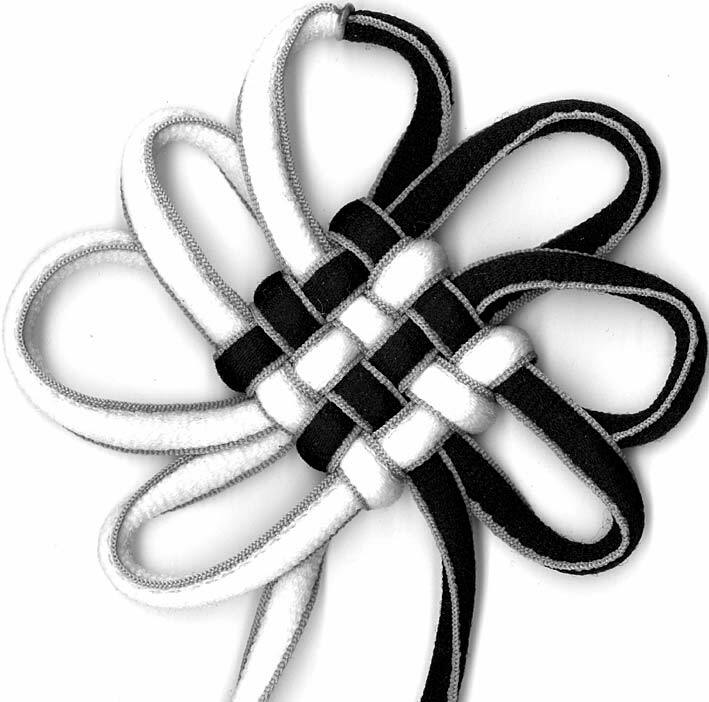 The graphic representation (see right) that is usually used to represent the endless knot is closer to the flower knot (square) but not quite. If you tie the graphic representation, you end up with something slightly more complex than a triple overhand. So is this popular graphic version (often carved into stone) a simplification of the true symbol (the knot as tied), is the tied knot an alternate symbol, or is the tied knot a late addition? While I'm talking about languages that I don't understand, in Japanese it is 玉房結び which machine translates as "jade room knot" (maybe they mean "temple knot"?). In Korean it is 국화매듭 which means "chrysanthemum knot". Many's the time I've read about "temple knots" and "priest knots". I've seen pictures here and there (none that I can find online at the moment, sorry) and they look mostly like wall hangings. The priest knots are worn by the priests, I believe, but I'm not sure exactly how that works as I've never seen an image of what looks like a wall hanging being worn. In any case, many knots have been identified as "temple knots" and the pan chang just happens to be one of them.